Inspired by the recent el Clasico, I thought now would be a good time to have the first Average Opposition Index player comparison. And who better to start with than the undoubted best players in the world. I’ll leave out Carlton Cole for the time being as he’s not playing in the same league (yet). Barcelona and Argentina’s Leo Messi, the current World Player of the year vs former World Player of the Year Cristiano Ronaldo of Real Madrid and Portugal. Both play as Forwards – whether that be down the middle or from wide, both are generally part of a front 3. As usual, I won’t be including European Champions League Average Opposition as these are not ranked in the same competition, instead I’ll include La Liga games only from the last two completed seasons – 2009-10 and 2010-11. I’ll also compare their international goal record from an Average Opposition Index perspective. From when Cristiano Ronaldo finally made his long anticipated move to Real Madrid in 2009, all eyes were on the show down between him and the existing king of La Liga – Leo Messi. 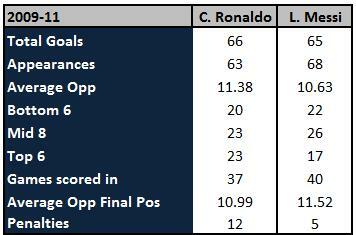 By way of comparison, in the two seasons in question, Messi made 68 appearances in the league compared to Ronaldo’s 63. In those appearances, Messi scored a mind boggling 65 league goals compared to the even more impressive 66 by Ronaldo. In terms of scoring alone, Ronaldo has a strike rate of 1.05 goals per game, compared to Messi’s 0.96. The 2009-10 season was Ronaldo’s first in a new league. With that in mind, his record of 26 goals from 29 appearances is phenomenal. Unfortunately for him, this is a comparison against Leo Messi. Messi’s 34 goals in just 35 appearances is even more impressive. Based on the Average Opponent per Goal at the time, Messi’s 10.50 is exactly where you’d expect a player to be and shows his high performance against all opposition. This is emphasised by the ranges of opposition he has scored against. 10 goals against the other 5 teams in the Top 6 excluding his own is a great achievement and inline with the other stats above. This includes a hat trick against 3rd placed Valencia and a double vs Sevilla (5th). 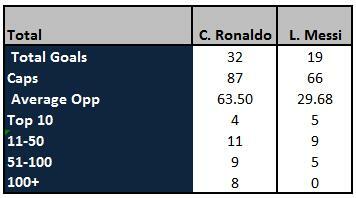 Ronaldo by comparison had an Average Opponent per Goal of 12.38 based on their position at the start of each round. Looking at his ranges, again, there is a good split between Top/Bottom 6 and also the majority in the Middle 8 is where we’d expect to see this. Where Ronaldo falls behind is that he’s 3 goals behind Messi vs Top 6 opposition, and 4 of his 26 goals were from the spot, compared to just one of Messi’s. Both scored in a similar number of games where comparing the Average Opposition Index for the final league positions, although Ronaldo’s increases to 11.85, Messi’s is still better despite it decreasing to 11.18. At the time of play and at the end of the season Messi did it against harder opposition, and more often. First and foremost, in a similar number of appearances, Ronaldo outscored Messi by a whopping 9 goals – take out each players penalties and there’s still 5 goals in it. In terms of the Average Opposition both were close enough to the expected 10.5 mark. However, where Ronaldo really shines is in the Top 6 goals. Of his 40 league goals (41 if you read Marca – the Madrid based and in no way biased sports paper), a massive 16 were against other members of the Top 6 including a four away at Sevilla, and a hat trick at home against Villarreal – one of 6 hat tricks scored in the season. It was against other members of the Top 6 that splits the two players – although Messi does come out on top in the number of games scored in. However, what the stats don’t tell is that 3rd-6th were a long way behind the big two. Valencia, who finished in 3rd were 21 points behind 2nd placed Madrid, whilst 4th placed Villarreal were 30 points behind. Towards the end of the season when it was clear that Barca were going to win the league, the Madrid players were going out of their way to provide for Ronaldo – he scored 11 in his last 4 games. In that same period, Barcelona had one eye on the Champions League final and Messi didn’t score one goal. Upto that point in the season, Messi was actually ahead of Ronaldo in the scoring charts. Though we should give credit where it’s due – 11 goals in 4 games in itself is an incredible achievement. Boosted by his late flourish, Ronaldo beats Messi in all but the number of games scored in. There’s one goal in it in Ronaldo’s favour, though he has scored 7 penalties more than his rival. Messi is ahead in games scored in and has an Average Opposition per goal of 10.63 compared to Ronaldo’s 11.38. Ronaldo is ahead on goals against the Top 6 whereas Messi trumps him in the other ranges. With the closeness in the goal scoring stakes, when looking for a winner and without wanting to sit on the fence it’s worth looking at some further factors. With the rest of the opposition so far behind Real Madrid and Barcelona, a better indicator than just looking at the Top 6 goals is the goals in the head to head games. In the four league games played, Messi has two goals compared to Ronaldo’s one. Something that continues to be levelled at Ronaldo is that he rarely performs well in the el Clasico’s. Even in last week’s game, he missed two good chances, and also neglected to pass to team mates in better positions. In the games last season, both scored a penalty in a 1-1 draw in Madrid, whilst in the first game in Barcelona, Messi was outstanding, laying on rather than scoring goals for his team mates in a 5-0 win. And it’s Messi’s ability to create that gives him the edge. Last season saw Messi top the assist league table with 18 compared to Ronaldo’s 10. Going back to 2009-10 season and it was a similar story – Messi leading Ronaldo. Both failed to impose themselves on the 2010 World Cup - one of the few criticisms that can be levelled at them. Messi’s solitary World Cup goal being in the 6-0 win over Serbia & Montenegro in a game famous for Cambiasso’s team goal back in 2006. Ronaldo scored in 2010, but it was against North Korea – ranked 105th in the World. This was in addition to his 2006 World Cup goal against Iran. For Ronaldo’s 2 goals in the European Championships (2004) see Messi’s 2 goals for Argentina in the 2007 Copa America. Taking into account the goals against each other and the assists that Messi provides, the argument up until now falls in Messi’s favour. 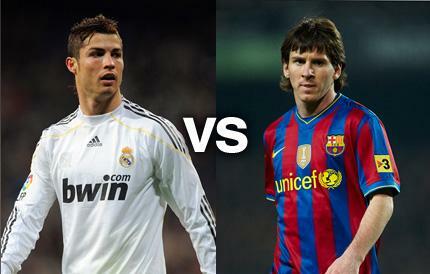 Both are outstanding players, but you can use the recent Real Madrid v Barcelona game as a microcosm of their rivalry. Take away Ronaldo’s goals and there’s not much else on offer, whereas Messi created the first goal after picking up the ball from his Centre Back, beating 4 men, and playing a perfect pass through for Sanchez to score. It was a similar story in the 5-0 win last season – Messi didn’t score but was man of the match. Both have 17 league goals this season, as this intriguing head to head continues. Both can count themselves unlucky that they’re playing at the same time as another 50+ goal a season forward (in all competitions), but it’s great for the neutral. Messi is ahead due to his all round game, but it’s far from over. I’ll revisit this at the end of the season. I came into this expecting a clear win for Messi, but the fact that it was assists that separates them says a lot for the rivalry.